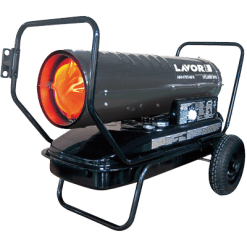 At Lavorwash, we supply a small but powerful and diverse range of Diesel Heaters. 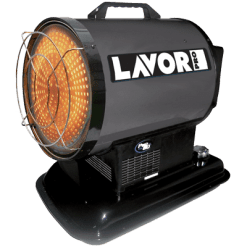 In the Lavor range, we have both the Diesel Commercial Space Heater and Forced Air Heater. Space heaters, or radiant heaters, produce radiant heat and are a lot quieter than the forced air models. This is done by heating a large round plate at the front of the machine with a burner. A small fan behind the plate then blows the radiant heat outwards. These types of heaters generally heat a slightly larger area than the equivalent fan forced models. They also can hold more fuel, and are also slightly more fuel efficient, therefore increasing the overall operating time. 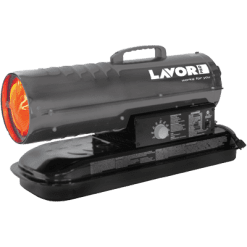 These types of heaters would be classed more as Warehouse Heaters than the other models because they are quiet. In saying that, fan forced can still heat a similar sized area. 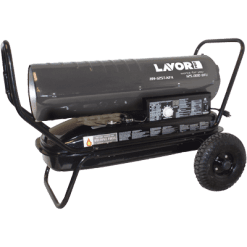 Forced air heaters are a different style of diesel heater. The units are a tubular or torpedo style unit, with the fuel tank attached to the bottom of it. A burner is situated at the back of the unit, in front of a fan. This burner produces a lot of heat when ignited. The “forced air” side of things come from the fan behind the burner which blows the heat through the tube and out towards the front cone. This style of heating is more of a direct heat rather than the radiant heat mentioned above. The more powerful fan and burner used in these models is what creates the noise. While all units we sell are classed as an Industrial Heater, both types of heaters can be used in similar ways. 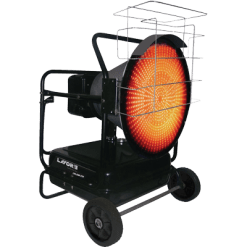 They can be used as a workshop heater, shed heater, warehouse heater or a factory heater as well. The main difference between the styles is the noise factor. The best way to choose which of the diesel heaters is right for you is to look through each unit and determine the following factors. BTU (British Thermal Unit) is the heating “power” of the unit. Heating Area is measured in Square Metres, these two forming the main basis of your choice. If you choose a small heater to heat a larger area than is recommended, the ongoing running costs will increase. The other factors to look at are Tank Size and Operating Time. These two generally go hand in hand to act as a guide for your ongoing general running costs. Lets use the example above, but do the opposite. If you choose a larger heater than is rated for your area, the heater won’t work as hard as normal. If the unit doesn’t need to work as hard, the ongoing running costs are decreased. Hopefully this little guide helps you choose the diesel heater that is right for you!